Action Traction Ice cleats provide instant traction for any outdoor winter activity. Great for both pedestrians and professionals, these Ice Cleats will help provide greater stability and safety while on snow and ice. Provide stability and safety to every step with Action Traction. Designed to be worn in the toughest conditions, and still great to wear around the house to prevent slips and falls. Q: What kind of shoes can I use my Action Traction Ice cleats with? 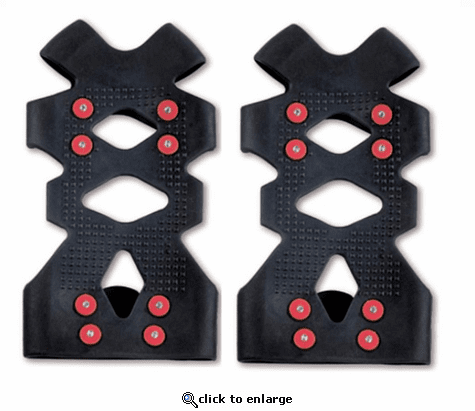 Q: How do I attach Action Traction Ice cleats to my shoes? A: Very easily! First position the Action Traction over the toe of your shoes or boots, and then holding the rear heel straps, stretch the length of your shoe and pull it up in the back. Adjust the cleats as necessary positioning them under your forefoot and heel. Q: On what surfaces can I wear Action Traction? A: Action Traction ice cleats can be worn on most surfaces outdoors. They are not intended for indoor use and can scratch floors and catch on carpeting. Action Traction are also not designed to work on hard slick surfaces such as tile, polished stones or metals that are totally smooth. Does anyone agree that the sizing listed wrong. Since a man's foot is larger, his sizes compared to a woman's sizes would be SMALLER. such as a man's 7 would be a woman's 8 or 8.5. So the medium size listed as men 7 -10.5 compared to a woman's 5-10 are incorrect! A 7 to 10 in men's would equal at 8 to 11 in woman's. (approximately).. Right?? This was a reorder - the cleats worked well; however, XL is an extremely tight fit on Sorels or other snow boots. I believe the cleats would last a bit longer if more size choices were available. ProsSaved from falling a dozen times, better than cable-type traction aids. I ordered 2 pair and they are good quality. I wish I had ordered a size larger because they seem to run small for my shoes. Gets on easily; stays on. the Action Traction system was sent to me in error after I ordered something else. I kept them in my office for several months until a snowy/icy day when I decided to try them. ProsEasy to put unto shoes or boots, and they stay on securely. ConsI did order some replacement disks, but I don't see directions tor applying them, They will slip on extremely hard smooth surfaces; don't trot across a marble floor.